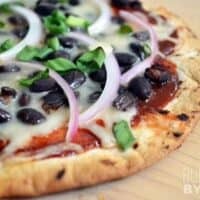 These thin & crispy BBQ Black Bean Pizzas are ready in about 15 minutes and will blow your tastes buds away. Preheat the oven to 400 degrees. Place the tortillas on a wire cooking rack and transfer the rack into the oven. Bake for 5 minutes, or until the tortillas have stiffened slightly, but are not yet crisp. If making more than two pizzas at once, you'll need to do this in batches. While the tortillas are pre-baking, thinly slice the red and green onions. Leave the tortillas on the cooling rack while adding the toppings. Top each pizza with 1-1.5 tablespoons of BBQ sauce, 1/4 cup of black beans (well drained), 1/4 cup shredded cheese, and a light sprinkle of both red and green onions. Transfer the cooling rack and topped pizzas back into the oven for an additional 5 minutes, or until the edges are golden brown and crispy, and the cheese is melted and bubbly. The tortillas might still be slightly soft after five minutes, but will crisp up after removing them from the oven. *I used black beans that I cooked from dry in my slow cooker.